2007-04-10 First worldwide family litigation filed litigation Critical https://patents.darts-ip.com/?family=18644647&utm_source=google_patent&utm_medium=platform_link&utm_campaign=public_patent_search&patent=EP1153964(B1) "Global patent litigation dataset” by Darts-ip is licensed under a Creative Commons Attribution 4.0 International License. The present invention relates to a method for surface treatment of an optical article of plastics material, hereinafter referred to as a "plastic article", and to a surface-treated optical plastic article. In particular, the present invention relates to a surface-treated plastic optical article exhibiting superior hydrophilicity, that is, wettability, and superior deposition resistance, that is, lipid-fouling resistance, etc., which has been surface-treated without degradation of properties as the plastic article. Specifically, the surface-treated plastic optical article according to the present invention is appropriately used for contact lenses and intraocular lenses. In recent years, plastic articles have been proposed for many purposes. Among those, various plastic articles containing silicon or fluorine have been proposed for contact lenses because of their excellent oxygen permeability. The plastic articles containing silicon or fluorine are, however, insufficient in wettability, and an improvement in their wettability has been demanded. In particular, various methods have been proposed in order to improve the lens performance (fitting characteristics, comfort etc.) in eyes by surface modification of contact lenses. For example, in US Patent No. 4214014, a method, in which the wettability is imparted to a contact lens by a plasma treatment in an oxygen atmosphere, is disclosed. In JP-A- 8-227001, a method, in which the wettability is imparted to a silicone containing hydrogel contact lens by a plasma treatment in the atmosphere of oxygen and/or carbon dioxide gas, is disclosed. Although the aforementioned conventional techniques have improved wettability, there have been problems in that the material quality of the plastic article was degraded due to the oxygen gas. In addition to this, there was a significant problem in that the wettability varied with time due to washings and a long term of use so as to become hydrophobic. US-A-5391589 discloses a contact lens made by graft polymerization. WO99/35520 concerns a process for multi-layer coating of a lens surface. We have conducted extensive research in order to alleviate the problems as discussed above, and found a method for surface treatment of the plastic optical article, to obtain good and stable wettability of the surface without variation with time, while maintaining, unchanged, the good inherent properties of the plastics. Accordingly, the present invention addresses the problem of providing a surface-treated plastic optical article having high transparency and high oxygen permeability, exhibiting excellent wettability and superior mechanical properties, and appropriately used for, in particular, contact lenses. The present invention also addresses the problem of providing a method for surface treatment of the aforementioned plastic optical article. According to a first aspect of the present invention there is provided a method for surface treatment of a plastic optical article, in which the plastic optical article is treated with at least one aqueous solution of at least one type of polymer having a weight average molecular weight of 200 or more. Thus, the present invention provides a method for surface treatment of a plastic optical article, the method comprising a first step of immersing the plastic optical articlein an aqueous solution of a first carboxyl functional polymer having a weight average molecular weight of 200 or more, and an optional second step of immersing the article in an aqueous solution of a second polymer having a weight average molecular weight of 200 or more, wherein any second polymer is a non-ionic water soluble polymer. According to a second aspect, the invention provides a plastic article, surface-treated with a carboxyl functional polymer having a weight average molecular weight of 200 or more. According to this aspect, the present invention provides a surface-treated plastic article, including a (preferably thin) surface layer composed of a polymer complex on the surface. As the surface-treated plastic article according to the present invention, plastic articles primarily composed of homopolymers of various monomers described below, copolymers of these monomers and other monomers, polymers containing silicon in at least one of the main chain and the side chain thereof, for example, polymers containing a siloxane bond or an organic silane group, e.g., trimethylsilyl group, or polymers containing a carbon-fluorine bond can be mentioned. As specific examples of the monomers for producing the aforementioned polymers, methacrylic acid (hydroxy)alkyl esters, for example, methyl methacrylate and 2-hydoxyethyl methacrylate, methacrylic esters containing silicon, for example, tris(trimethylsiloxy)silylpropyl methacrylate, methacrylic esters containing fluorine, and polydimethylsiloxane having a double-bond at a single terminal or at each of both terminals, can be mentioned. As the monomer which can copolymerize, mono-functional monomers, for example, methacrylic acid ester-based monomers, aromatic vinyl monomers, and heterocyclic vinyl monomers, multi-functional monomers, for example, di-functional methacrylates, tri-functional methacrylates, tetra-functional methacrylates, aromatic divinyl monomers, and aromatic diaryl monomers, etc., can be mentioned. As specific examples of the mono-functional monomer, alkyl methacrylates, for example, methyl methacrylate and ethyl methacrylate, carboxylic acids, for example, methacrylic acid, cycloalkyl methacrylates, for example, cyclohexyl methacrylate, halogenated alkyl methacrylates, for example, trifluoroethyl methacrylate and hexafluoroisopropyl methacrylate, hydroxyalkyl methacrylates having a hydroxyl group, for example, 2-hydroxyethyl methacrylate and 2,3-dihydroxypropyl methacrylate, acrylamides, for example, acrylamide, N,N-dimethylacrylamide, and N,N-diethylacrylamide, methacrylic acid esters having a siloxanyl group, for example, tris(trimethylsiloxy)silylpropyl methacrylate and bis(trimethylsiloxy)methylsilylpropyl methacrylate, aromatic vinyl monomers, for example, styrene and vinylpyridine, styrene derivatives having a siloxanyl group, for example, tris(trimethylsiloxy)silylstyrene, styrene derivatives having fluorine, for example, pentafluorostyrene, and heterocyclic vinyl monomers, for example, N-vinyl pyrrolidone, can be mentioned. As specific examples of the di-functional monomer, ethylene glycol dimethacrylate, diethylene glycol dimethacrylate, bisphenol A dimethacrylate, bisphenol A dimethacrylate ethylene oxide adduct or urethane-modified substances thereof, propylene glycol dimethacrylate, glycerol dimethacrylate and neopentyl glycol dimethacrylate, can be mentioned. As specific examples of the tri-functional monomer, trimethylolpropane trimethacrylate and trimethylolpropane trimethacrylate ethylene oxide adducts, can be mentioned. As specific examples of the tetra-functional monomer, tetramethylolmethane tetramethacrylates can be mentioned. As a specific example of the aromatic divinyl monomers, divinylbenzene can be mentioned. As a specific example of the aromatic diallyl monomers, diallyl phthalate can be mentioned. As specific examples of other multi-functional monomers, bismaleimide and allyl methacrylate, can be mentioned. The plastic article used in the present invention may be a water-containing hydrogel, may be a rubber-like polymer (elastomer) not containing water, or may be a hard polymer containing no water or containing small amounts of water depending on the ratios of these monomers in copolymerization and the kinds of used monomers. The surface-treated plastic article according to the present invention may be transparent or may be opaque, although since the hydrogel and the plastic article containing at least one of a silicon atom and a fluorine atom are superior in oxygen permeability, those are preferably used for the optical articles, so that transparency is preferably imparted thereto. Regarding the polymer constituting the surface-treated plastic article according to the present invention, in the case in which the polymer is a hydrogel, the combination of a hydrophilic monomer and a cross-linking agent and the combination of a hydrophobic monomer, a hydrophilic monomer, and a cross-linking agent are preferably used. For example, the combination of 2-hydoxyethyl methacrylate and ethylene glycol dimethacrylate, and the combination of 2,3-dihydroxypropyl methacrylate, methyl methacrylate, and diethylene glycol dimethacrylate are mentioned. In the case in which the hydrogel contains at least one of a silicon atom and a fluorine atom, the combinations of methacrylic acid esters having a siloxanyl group, for example, tris(trimethylsiloxy)silylpropyl methacrylate or a silicone component, for example, polydimethylsiloxane containing double bonds at both ends, a component containing fluorine, for example, hexafluoroisopropyl methacrylate, a hydrophilic component, for example, N,N-dimethylacrylamide and N-vinyl pyrrolidone, and a cross-linking agent are mentioned. In the case of plastic articles which contains substantially no water and contains the component containing silicon and/or fluorine atom, the content of the component containing the silicon atom or the fluorine atom, may be 100% by weight, although the content is preferably 5% by weight or more, more preferably is 30% by weight or more, from the view point of the maintenance of the balance between the oxygen permeability and the mechanical properties. Regarding the method for the polymerization, conventional methods can be used. The surface-treated plastic article according to the present invention may contain an ultraviolet absorbent, a coloring matter, colorant, etc. In the production of the plastic article used in the present invention, in order to facilitate the polymerization, thermal polymerization initiators or photopolymerization initiators, typified by peroxides and azo compounds, are preferably blended. In the thermal polymerization, the initiator exhibiting optimal decomposition performance at the desired reaction temperature is selected and used. In general, the peroxide-based initiators and azo-based initiators, having a half-life of 10 hours at a temperature of 40° to 120°C, are appropriate. As the photopolymerization initiator, carbonyl compounds, peroxides, azo compounds, sulfur compounds, halogen compounds, metallic salts, etc., are mentioned. These polymerization initiators are used solely or as mixtures, in an amount up to about 1% by weight. In the production of the plastic article used in the present invention, polymerization solvents can be used. As the solvent, various organic and inorganic solvents can be applied. Although not specifically limited, for example, water, various alcohol solvents, e.g., methanol, ethanol, propanol, 2-propanol, butanol and tert-butanol, various aromatic hydrocarbon-based solvents, e.g., benzene, toluene and xylene, various aliphatic hydrocarbon-based solvents, e.g., hexane, heptane, octane, decane, petroleum ether, kerosene, ligroin and paraffin, various ketone-based solvents, e.g., acetone, methyl ethyl ketone and methyl isobutyl ketone, various ester-based solvents, e.g., ethyl acetate, butyl acetate, methyl benzoate and dioctyl phthalate, and various glycol ether-based solvents, e.g., diethyl ether, tetrahydrofuran, dioxane, ethylene glycol dialkyl ether, diethylene glycol dialkyl ether, triethylene glycol dialkyl ether, tetraethylene glycol dialkyl ether and polyethylene glycol dialkyl ether, can be mentioned. These can be used solely or as mixtures. A plastic article embodying the present invention can be produced by, for example, the following method. That is, polymers may be molded into rods and plates at first, and then, may be worked into desired shape. Other known techniques, such as mold polymerization may be used. As an example, the case in which a plastic article embodying the invention is produced by the mold polymerization will be explained below. The monomer mixture of the aforementioned monomer composition and the polymerization initiator are placed in the space between a pair of molds having specified shapes, and are molded into the shape of the molds by photopolymerization or thermal polymerization. The molds are made of resins, glass, ceramics, metals, etc. In the photopolymerization, optically transparent materials may be used, and usually, resins and glass are used. In the production of the plastic articles, in many cases, a pair of faced molds form the space, and a monomer mixture is placed in the space, although a gasket may be concurrently used for imparting specified thickness to the plastic article and for preventing monomer mixture liquid placed in the space from leaking. The molds, in which the monomer mixtures are placed in the spaces, may be subsequently subjected by irradiation of an activation ray, such as an ultraviolet ray, or may be subjected to heating and polymerization in an oven or a liquid bath. A double-polymerization method in which thermal polymerization is performed after photopolymerization, or, on the contrary, photopolymerization is performed after thermal polymerization, may be concurrently used. Regarding the photopolymerization, in general, light, primarily including ultraviolet ray, using, for example, a mercury lamp and an insect collection lamp as the light source, is irradiated for a short time, usually within one hour. Regarding the thermal polymerization, in order to maintain the optical uniformity and quality of the plastic article, and to improve the reproducibility, it is appropriate to gradually raise the temperature from the vicinity of room temperature to 60° to 200°C over a period of time several hours to several tens of hours. It was found that a very simple treatment of immersing a plastic article in at least one aqueous solution of at least one type of material selected from high molecular weight acids, high molecular weight bases, and water-soluble polymers, each having a weight average molecular weight of 200 or more, exhibited surprising effects of improving the hydrophilicity (water wettability) of the plastic article, and of maintaining these. In particular, high molecular weight acids and bases having average molecular weights of 500 or more are preferably used from the viewpoint of preventing the plastic articles from degrading due to the acids and the bases. Furthermore, regarding the treatment of hydrogel plastic articles, high molecular weight acids and bases having average molecular weights of 1,000 or more are preferably used. Regarding the treatment with aqueous solutions of a polymer having a weight average molecular weight of 500 or more, since the polymers do not penetrate into the inside of the plastic articles, the plastic articles are not likely to degrade due to the cleavage of at least one of the main chains and side chains. In order to effectively improve the hydrophilicity (wettability) and to maintain the effects for a long term, an aqueous polymer solution having a pH of 4 or less or a pH of 8 or more is preferably used. The treatment with the aqueous polymer solution, having a pH of more than 4 and less than 8, may take a long time to produce the hydrophilicity, and in some cases, sufficient hydrophilicity may not be produced. The treatment temperature is usually 1° to 99°C, and preferably in the vicinity of Tg of the base material to be treated. The treatment time is usually 1 to 72 hours in order to produce a sufficient treatment effect. Regarding the present invention, two types of aqueous polymer solution may be used. That is, immersion in a first polymer aqueous solution, treatment, and washing are performed, and thereafter, immersion in a second aqueous polymer solution, and treatment are performed. Accompanying this, the natures of the surface, such as ionicity and nonionicity, can be appropriately changed. As the acid, having a weight average molecular weight of 200 or more, used for the surface treatment of the plastic article, a carboxyl functional polymer is employed. The carboxyl functional polymer means a polymer having the -COOH group in the molecule. Most of all, a polymer selected from the group consisting of polymethacrylic acid, polyitaconic acid and copolymers of methacrylic acid, maleic acid, itaconic acid, or maleic anhydride and a reactive vinyl monomer, or a mixture thereof can be appropriately used. The weight average molecular weight of these carboxyl functional polymers are preferably 5,000 or more, and more preferably are 20,000 or more since the wettability of the surface can be improved without degradation of mechanical properties of the hydrogel. By using the aforementioned high molecular weight carboxyl functional polymers, strong polymer complexes can be formed with the hydrophilic polymers in the hydrogel base materials, and the effects thereof can be maintained for an even longer term. As the carboxyl functional polymer, poly acrylic acid and alternative copolymer of maleic anhydride with vinyl monomer can be appropriately used from the viewpoint of the ability of forming polymer complexes, the long term maintenance of the effects, and the available ease of the high molecular weight products. Regarding the treatment of the hydrogel plastic article with two types of aqueous polymer solution, in the case in which the aqueous solution of the carboxyl functional polymer is used as the first aqueous polymer solution, the non-ionic water-soluble polymer is preferably used as the second aqueous polymer solution. The non-ionic water-soluble polymer means a water-soluble polymer not containing an ionic group, and polyacrylamide, polydimethylacrylamide, polyvinyl pyrrolidone, polyethylene glycol, polyethylene oxide and polyvinyl alcohol, or a mixture thereof are preferably used. These non-ionic polymers form thin layers of polymer complexes with the carboxyl functional polymers on the thin layers of polymer complexes formed by the immersion treatment in the first aqueous solutions, so that the properties of the surfaces can be changed. As the preferred embodiments of the surface-treated plastic article according to the present invention, lenses, fibers, films, etc., can be mentioned. In particular, the surface-treated plastic article is appropriately used for optical articles, for example, contact lenses, intraocular lenses, and plastic lenses, from the viewpoint of excellent optical properties, high oxygen permeability, excellent wettability and mechanical properties, and is also appropriately used for medical devices, such as catheters and artificial kidneys, because of the wettability of the surface and the sliding ease accompanying the wettability. In the case in which the optical articles according to the present invention are used for optical articles contacting with corneas, such as contact lenses, the optical articles are preferably hydrogels, and their water content is preferably 15% or more. By this, the movement of the lenses, which is required of the optical articles contacting with corneas, becomes smooth, so that the lenses can be worn with further safety. Embodiments of the invention will now be described in more detail with reference to the accompanying drawings and the following Examples. In the drawing, Fig. 1 is a diagram showing ATR spectra of a plastic article untreated and treated with PAA and a differential spectrum therebetween. In the Examples, measurements and evaluations were performed in accordance with the following methods. wherein W designates the weight (g) of the plastic article after the hydration treatment, and WO indicates the weight (g) of the plastic article in a dry state. Using a plastic article having a size of about 5 mm by 10 mm by 0.1 mm, advancing dynamic contact angles relative to a boric acid buffer solution having a pH of 7.1 to 7.3 were measured. The immersion velocity was 0.1 mm/sec, and the depth of the immersion was 7 mm. After water had been removed from the surface by blowing with nitrogen gas, the static contact angles of water were measured with a CA-D type contact angle meter, manufactured by Kyowa Kaimen Kagaku K.K., using water treated with a reverse osmosis membrane. x: the surface of the plastic article is hardly wetted. A plastic article having a size of about 15 mm by 10 mm by 0.1 mm was used as a sample, and the modulus and the elongation at break were measured using a Tensilon RTM-100 manufactured by Toyo Baldwin K.K. The tensile speed was 100 mm/min, and the chuck interval was 5 mm. A plastic article having a diameter of 15 mm was used as a sample, and the oxygen permeability coefficient was measured using a Seikaken-type film-oxygen permeameter manufactured by Rikaseiki Kogyo K.K. in water at 35°C. The thickness of the sample was adjusted by stacking a plurality of sheets if necessary. 60 parts by weight of tris(trimethylsiloxy)silylpropyl methacrylate (abbreviated as TRIS), 40 parts by weight of N,N-dimethylacrylamide (abbreviated as DMAA), 1 part by weight of triethylene glycol dimethacrylate (abbreviated as 3G), and 10 parts by weight of diethylene glycol dimethyl ether (abbreviated as Diglyme) were uniformly mixed. After 0.2 parts by weight of "Darocur1173", manufactured by Ciba Specialty Chemicals, as a polymerization initiator was added thereto, the resulting monomer mixture was degassed in an argon atmosphere. The degassed monomer mixture was injected between plastic molds and was sealed in a glove box in an atmosphere of nitrogen. Then, the light irradiation was performed using an insect collection lamp at an illumination of 1 mW/cm2 for 30 minutes so as to perform polymerization. Subsequently, the molds including the resulting plastic were immersed in diethylene glycol dimethyl ether at 40°C for 30 minutes, and in addition to this, were immersed at 60°C for 60 minutes, and then, the resulting plastic article to be treated was released from the molds. As the immersion solution, isopropyl alcohol was substituted for diethylene glycol dimethyl ether, and the remaining monomers were extracted by heating at 60°C for 16 hours. The resulting plastic article to be treated was washed two times with isopropyl alcohol. Thereafter, the washed plastic article was immersed in a solution composed of 50 parts by weight of isopropyl alcohol and 50 parts by weight of purified water for 30 minutes, and then, was immersed in a solution composed of 25 parts by weight of isopropyl alcohol and 75 parts by weight of purified water for 30 minutes, and furthermore, was immersed in purified water and was left standing for 16 hours, so that isopropyl alcohol was completely removed from the plastic article to produce the plastic article to be treated. The resulting plastic article to be treated was immersed in an aqueous solution, having a pH of 2.3, containing 15% by weight of polyacrylic acid having an average molecular weight of 25,000 at 40°C for 8 hours. Subsequently, the resulting plastic article was sufficiently washed with purified water, was placed in a vial containing a boric acid buffer solution having a pH of 7.1 to 7.3, and was sealed. The resulting vial was placed in an autoclave, and was subjected to a boiling treatment at 120°C for 30 minutes. After the vial had been left standing for cooling, the plastic article was taken out of the vial, and was immersed in the boric acid buffer solution having a pH of 7.1 to 7.3. The water content, dynamic contact angle, wettability, modulus, elongation at break and oxygen permeability coefficient of the resulting plastic article were measured. The results thereof are shown in Table 1. A surface-treated plastic article was produced in a manner similar to that in Example 1, except that the aqueous solution containing polyacrylic acid in Example 1 was changed to an aqueous solution, having a pH of 2.0, containing 20% by weight of polyacrylic acid having an average molecular weight of 5,000. The water content, dynamic contact angle, wettability, modulus and elongation at break of the resulting plastic article are shown in Table 1. A surface-treated plastic article was produced in a manner similar to that in Example 1, except that the aqueous solution containing polyacrylic acid in Example 1 was changed to an aqueous solution, having a pH of 3.1, containing 1.2% by weight of polyacrylic acid having an average molecular weight of 250,000. The water content, dynamic contact angle, wettability, modulus and elongation at break of the resulting plastic article are shown in Table 1. A plastic article was produced in a manner similar to that in Example 1, except that the treatment with the aqueous solution containing polyacrylic acid in Example 1 was omitted. The water content, dynamic contact angle, wettability, modulus, elongation at break and oxygen permeability coefficient of the resulting plastic article are shown in Table 1. A surface-treated plastic article was produced in a manner similar to that in Example 1, except that tris(trimethylsiloxy)silylpropyl methacrylate in Example 1 was changed to 68.75% by weight of the following compound M1 (abbreviated as SiOEMMA), 20.83% by weight of N,N-dimethylacrylamide (abbreviated as DMAA), and 10.42% by weight of N,N-methoxyethylacrylamide (abbreviated as MEAA), and the treatment condition with the aqueous solution containing polyacrylic acid in Example 1 was changed to at 60°C for 24 hours. The water content, dynamic contact angle, wettability, modulus and elongation at break of the resulting plastic article are shown in Table 1. A surface-treated plastic article was produced in a manner similar to that in Example 4, except that the aqueous solution containing polyacrylic acid in Example 4 was changed to an aqueous solution, having a pH of 11.78, containing 30% by weight of polyethyleneimine having an average molecular weight of 600, and the treatment condition in Example 4 was changed to at 23°C for 72 hours. The water content, dynamic contact angle and wettability of the resulting plastic article are shown in Table 1. This Reference Example is included for information only and does not illustrate the invention of accompanying claim 1. A plastic article was produced in a manner similar to that in Example 5, except that the treatment with the aqueous solution containing polyethyleneimine in Example 5 was omitted. The water content, dynamic contact angle, wettability, modulus and elongation at break of the resulting plastic article are shown in Table 1. A surface-treated plastic article was produced in a manner similar to that in Example 1, except that tris(trimethylsiloxy)silylpropyl methacrylate in Example 1 was changed to 70% by weight of the following compound M2 (abbreviated as SiMAA2), and 30% by weight of N,N-dimethylacrylamide (abbreviated as DMAA). The water content, dynamic contact angle, wettability, modulus and elongation at break of the resulting plastic article are shown in Table 1. A surface-treated plastic article was produced in a manner similar to that in Example 1, except that tris(trimethylsiloxy)silylpropyl methacrylate in Example 1 was changed to 70% by weight of the following compound M3 (abbreviated as SiMAA3), and 30% by weight of N,N-dimethylacrylamide. The water content, dynamic contact angle, wettability, modulus and elongation at break of the resulting plastic article are shown in Table 1. A surface-treated plastic article was produced in a manner similar to that in Example 1, except that the monomers in Example 1 were changed to 21.33 parts by weight of tris(trimethylsiloxy)silylpropyl methacrylate, 42.67 parts by weight of the compound M1 (abbreviated as SiOMMA), and 36 parts by weight of N,N-dimethylacrylamide (abbreviated as DMAA), and the aqueous solution in Example 1 was changed to an aqueous solution, having a pH of 2.6, containing 5% by weight of polyacrylic acid having an average molecular weight of 150,000. The water content, dynamic contact angle, wettability, modulus, elongation at break and oxygen permeability coefficient of the resulting plastic article are shown in Table 1. A Fourier transform infrared spectrum of a surface-treated plastic article embodying the present invention measured by Attenuated Total Reflection Spectroscopy (FTIR-ATR method) is shown in Fig. 1. The result of the measurement by the FTIR-ATR method regarding the plastic article according to Comparative Example 3, and the differential spectrum, which is obtained by subtracting the measurement result regarding Comparative Example 3 from the measurement result regarding Example 8, are also shown in Fig. 1. As is clear from Fig. 1, regarding the plastic article treated with polyacrylic acid, designated by NS07 (PAA), carboxylic acid (hydroxyl group) is increased as shown by an increase in 3,000 to 3,500 cm-1 band and an increase in 1,720 cm-1 band, carboxylate is increased as shown by an increase in 1,404 to 1,442 cm-1 band and in 1,556 cm-1 band, and amide is decreased as shown by a decrease in 1,645 cm-1 band compared to the plastic article not treated with polyacrylic acid, designated by NS07 (not treated). The increases of carboxylic acid and carboxylate indicate that polyacrylic acid is present on the surface of the surface-treated plastic article due to some interactions. On the other hand, amide is believed to be derived from dimethylacrylamide which is a hydrophilic component. Since this amide bond is very stable, the amide bond is not normally hydrolyzed by the aqueous solution having a pH of 2.6 or so. Therefore, it is believed that polydimethyl-acrylamide in the base material for the plastic article and polyacrylic acid formed a polymer complex, a thin layer of the resulting complex was formed on the surface, and as a consequence, the apparent density of the amide bond of dimethylacrylamide was decreased so as to exhibit the aforementioned differential spectrum. A plastic article was produced in a manner similar to that in Example 8, except that the treatment with the aqueous solution containing polyacrylic acid in Example 8 was omitted. The water content, dynamic contact angle, wettability, modulus, elongation at break and oxygen permeability coefficient of the resulting plastic article are shown in Table 1. A surface-treated plastic article was produced in a manner similar to that in Example 8, except that the monomers in Example 8 were changed to 31.5 parts by weight of tris(trimethylsiloxy)silylpropyl methacrylate (abbreviated as TRIS), 31.5 parts by weight of the compound M2 (abbreviated as SiMAA2), and 37 parts by weight of N,N-dimethylacrylamide (abbreviated as DMAA). The water content, dynamic contact angle, wettability modulus, elongation at break and oxygen permeability coefficient of the resulting plastic article are shown in Table 2. A plastic article was produced in a manner similar to that in Example 9, except that the treatment with the aqueous solution containing polyacrylic acid in Example 9 was omitted. 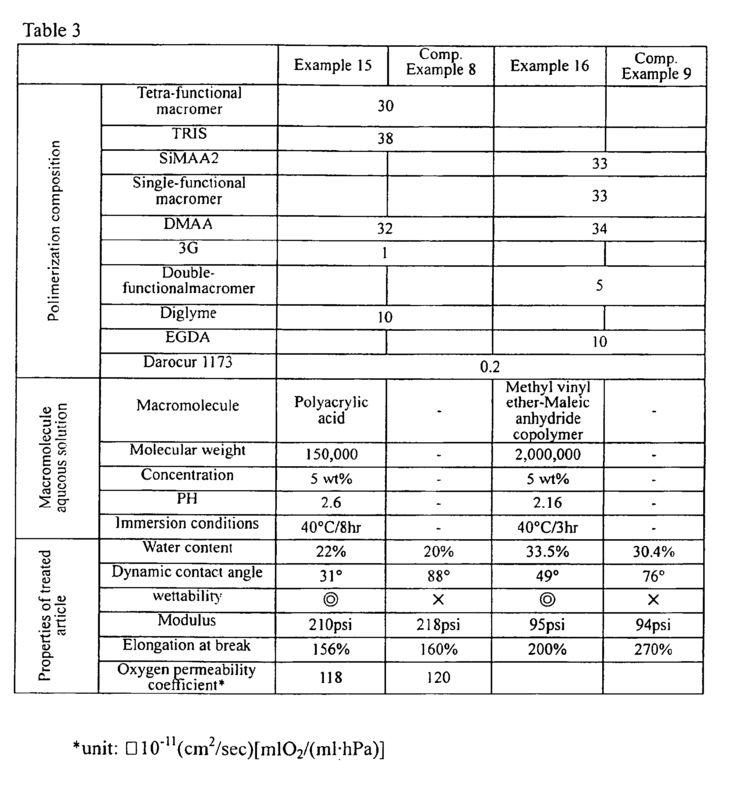 The water content, dynamic contact angle, wettability, modulus, elongation at break and oxygen permeability coefficient of the resulting plastic article are shown in Table 2. A surface-treated plastic article was produced in a manner similar to that in Example 1, except that the monomers in Example 1 were changed to 30 parts by weight of tris(trimethylsiloxy)silylpropyl methacrylate (abbreviated as TRIS), 30 parts by weight of tris(trimethylsiloxy)silylpropyl acrylate (abbreviated as TRIS-A), and 40 parts by weight of N,N-dimethylacrylamide (abbreviated as DMAA). The water content, dynamic contact angle, wettability, modulus and elongation at break of the resulting plastic article are shown in Table 2. 30.5 parts by weight of the compound M2 (abbreviated as SiMAA2), 30.5 parts by weight of tris(trimethylsiloxy)silylpropyl methacrylate (abbreviated as TRIS), 39 parts by weight of N,N-dimethylacrylamide (abbreviated as DMAA), 1 part by weight of triethylene glycol dimethacrylate (abbreviated as 3G), and 10 parts by weight of diethylene glycol dimethyl ether (abbreviated as Diglyme) were uniformly mixed. After 0.2 parts by weight of "Darocur1173" manufactured by Ciba Specialty Chemicals, as a polymerization initiator, had been added thereto, a plastic article to be treated was produced in a manner similar to that in Example 1. On the other hand, 0.5 g of isobutylene-maleic anhydride copolymer having a molecular weight of 160,000 to 170,000 ("Isoban" 10, manufactured by KURARAY CO., LTD.) was dispersed in 50 ml of 0.65N NaOH solution, and the resulting solution was agitated at 90°C until the solution had become transparent. Thereafter, 3 ml of 1N HCl was added, so that the pH was adjusted to 2.82. In this aqueous polymer solution, the aforementioned plastic article to be treated was immersed at 40°C for 5 hours. Subsequently, the resulting plastic article was sufficiently washed with purified water, was placed in a vial containing a boric acid buffer solution having a pH of 7.1 to 7.3, and was sealed. The resulting vial was placed in an autoclave, and was subjected to a boiling treatment at 120°C for 30 minutes. After the vial had been left standing for cooling, the plastic article was taken out of the vial, and was immersed in a boric acid buffer solution having a pH of 7.1 to 7.3. The water content, dynamic contact angle, wettability and oxygen permeability coefficient of the resulting plastic article were measured. The results thereof are shown in Table 2. Methyl vinyl ether-maleic anhydride copolymer having a molecular weight of 216,000 ("Gantrez" AN-119, manufactured by International Specialty Products Inc.) was dispersed in purified water, and the resulting solution was agitated at 85 to 90°C so as to produce a transparent 10% by weight aqueous solution. The water content, dynamic contact angle, wettability and oxygen permeability coefficient of the plastic article, produced in a manner similar to that in Example 11, except that the aforementioned methyl vinyl ether-maleic anhydride copolymer was used instead of the isobutylene-maleic anhydride copolymer in Example 11, were measured. The results thereof are shown in Table 2. A plastic article was produced in a manner similar to that in Example 11, except that the treatment with the aqueous solution containing isobutylene-maleic anhydride copolymer in Example 11 was omitted. 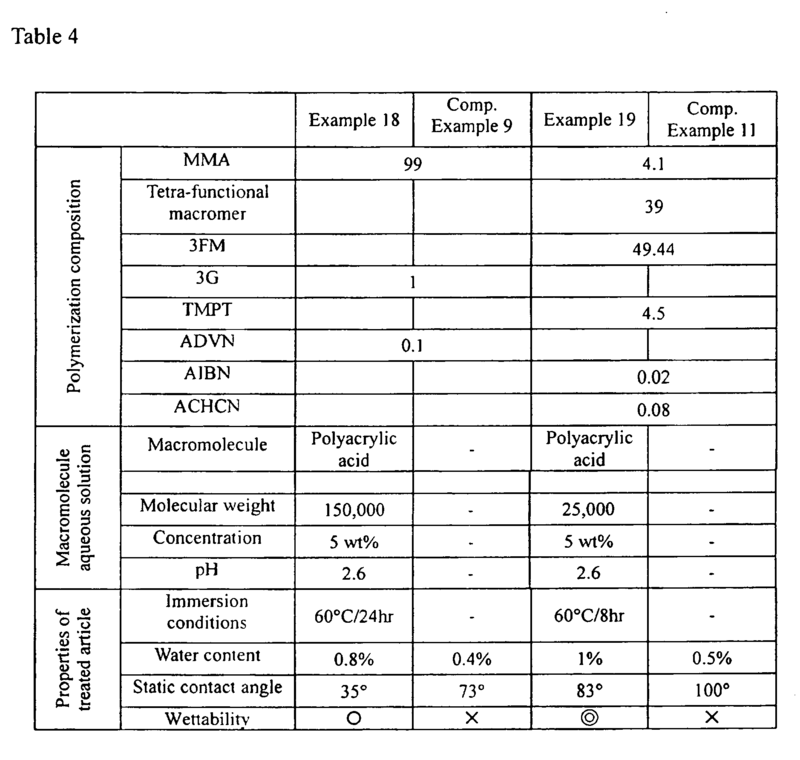 The water content, dynamic contact angle, wettability and oxygen permeability coefficient of the resulting plastic article are shown in Table 2. A surface-treated plastic article was produced in a manner similar to that in Example 9, except that the monomers in Example 9 were changed to 30 parts by weight of tris(trimethylsiloxy)silylpropyl methacrylate (abbreviated as TRIS), 30 parts by weight of the compound M2 (abbreviated as SiMAA2), and 40 parts by weight of 2-hydroxyethyl methacrylate (abbreviated as HEMA). The water content, dynamic contact angle, wettability, modulus and elongation at break of the resulting plastic article are shown in Table 2. A plastic article was produced in a manner similar to that in Example 13, except that the treatment with the aqueous solution containing polyacrylic acid in Example 13 was omitted. The water content, dynamic contact angle and wettability of the resulting plastic article are shown in Table 2. 100 parts by weight of 2-hydroxyethyl methacrylate (abbreviated as HEMA), 1 part by weight of triethylene glycol dimethacrylate (abbreviated as 3G), and 0.2 parts by weight of "Darocur1173" manufactured by Ciba Specialty Chemicals were uniformly mixed, and were photopolymerized using an insect collection lamp in a manner similar to that in Example 1. The resulting polymer was released from the molds in purified water, and thereafter, was subjected to a boiling treatment at 120°C for 30 minutes in purified water using an autoclave so as to produce a hydrogel. This hydrogel was immersed in an aqueous solution containing 5% by weight of polyacrylic acid, having a molecular weight of 150,000, at 40°C for 8 hours. Subsequently, the resulting hydrogel was sufficiently washed with purified water, was placed in a vial containing a boric acid buffer solution having a pH of 7.1 to 7.3, and was sealed. The resulting vial was placed in an autoclave, and was subjected to a boiling treatment at 120°C for 30 minutes. After the vial had been left standing for cooling, the plastic article was taken out of the vial, and was immersed in a boric acid buffer solution having a pH of 7.1 to 7.3. The water content, dynamic contact angle and wettability of the resulting plastic article were measured. The results thereof are shown in Table 2. A plastic article was produced in a manner similar to that in Example 14, except that the treatment with the aqueous solution containing polyacrylic acid in Example 14 was omitted. The water content, dynamic contact angle and wettability of the resulting plastic article are shown in Table 2. 52 parts of 2-hydroxyethyl methacrylate, 53.4 parts of 2,6-diisocyanatocaproic acid-β-isocyanatoethyl ester, and 0.01 parts of di-n-butyltin dilaurate were placed into a four neck flask provided with an agitator, a thermometer, a reflux condenser, and a nitrogen gas inlet, and were agitated at 50°C in a nitrogen atmosphere until the absorption assigned to the hydroxyl group disappeared from an infrared absorption spectrum. Next, 300 parts of the following compound M4 having an average molecular weight of 3,000 was added into the aforementioned four neck flask, and the resulting mixture was agitated at 50°C in a nitrogen atmosphere until the absorption assigned to the isocyanato group disappeared from an infrared absorption spectrum so as to produce siloxane macromer having two double-bonds at each of both ends (abbreviated as tetra-functional macromer). A surface-treated plastic article was produced in a manner similar to that in Example 8, except that the monomers in Example 8 were changed to 30 parts by weight of the aforementioned tetra-functional macromer, 38 parts by weight of tris(trimethylsiloxy)silylpropyl methacrylate (abbreviated as TRIS), and 32 parts by weight of N,N-dimethylacrylamide (abbreviated as DMAA). The water content, dynamic contact angle, wettability, modulus, elongation at break and oxygen permeability coefficient of the resulting plastic article were measured. The results thereof are shown in Table 3. A plastic article was produced in a manner similar to that in Example 15, except that the treatment with the aqueous solution containing polyacrylic acid in Example 15 was omitted. The water content, dynamic contact angle, wettability, modulus, elongation at break and oxygen permeability coefficient of the resulting plastic article were measured. 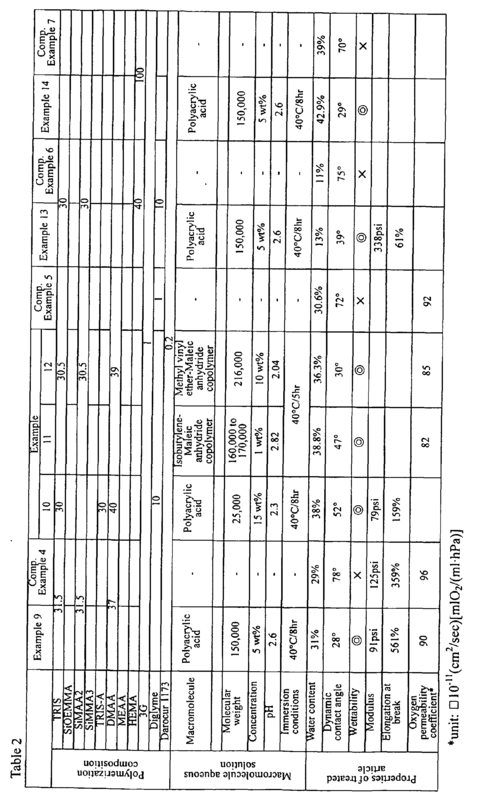 The results thereof are shown in Table 3.
and 10 parts by weight of ethylene glycol diacetate (abbreviated as EGDA) were uniformly mixed. After 0.2 parts by weight of "Darocur1173" manufactured by Ciba Specialty Chemicals, as a polymerization initiator, had been added thereto, a plastic article to be treated was produced in a manner similar to that in Example 1. On the other hand, methyl vinyl ether-maleic anhydride copolymer having a molecular weight of about 2,000,000 ("Gantrez" AN-169, manufactured by International Specialty Products Inc.) was dispersed in purified water, and the resulting solution was agitated at 85 to 90°C so as to produce a transparent 5% by weight aqueous solution. In this aqueous polymer solution, the aforementioned plastic article to be treated was immersed at 40°C for 3 hours. Subsequently, the resulting plastic article was sufficiently washed with purified water, was placed in a vial containing a boric acid buffer solution having a pH of 7.1 to 7.3, and was sealed. The resulting vial was placed in an autoclave, and was subjected to a boiling treatment at 120°C for 30 minutes. After the vial had been left standing for cooling, the plastic article was taken out of the vial, and was immersed in the boric acid buffer solution having a pH of 7.1 to 7.3. The water content, dynamic contact angle, wettability, modulus and elongation at break were measured. The results thereof are shown in Table 3. A plastic article was produced in a manner similar to that in Example 16, except that the treatment with the aqueous solution containing methyl vinyl ether-maleic anhydride copolymer in Example 16 was omitted. The water content, dynamic contact angle, wettability, modulus and elongation at break of the resulting plastic article were measured. The results thereof are shown in Table 3. The plastic article, treated with polyacrylic acid, produced according to Example 9 was immersed in an aqueous solution containing 0.05% of polyacrylicamide, having a molecular weight of about 1,000,000, at 40°C for 8 hours. Subsequently, the resulting plastic article was sufficiently washed with purified water, was placed in a vial containing a boric acid buffer solution having a pH of 7.1 to 7.3, and was sealed. The resulting vial was placed in an autoclave, and was subjected to a boiling treatment at 120°C for 30 minutes. After the vial had been left standing for cooling, the plastic article was taken out of the vial, and was immersed in a boric acid buffer solution having a pH of 7.1 to 7.3. The resulting plastic article had a water content of 32.8%, a dynamic contact angle of 34°, a modulus of 105 psi, and an elongation at break of 750%. These values indicated that the nature of the surface was changed compared to that in the case in which only the treatment with polyacrylic acid was performed so as to exhibit a water content of 31%, a dynamic contact angle of 28°, a modulus of 91 psi, and an elongation at break of 561%. In order to confirm this point, an experiment for measuring adsorption of lysozyme from egg white was performed. 0.5 g of lysozyme from egg white was dissolved into 100 ml of boric acid buffer solution so as to prepare an artificial foul solution. A sheet of sample was immersed in 1 ml of the resulting foul solution, and was left standing at 35°C for 20 hours. After completion of the immersion treatment, the sample was taken out and was left standing in the boric acid buffer solution for 5 hours. Thereafter the resulting sample was pulled up and was lightly wiped to remove water. The amount of adsorbed lysozyme was determined by measuring absorbance at 562 nm using a Micro BCA Protein Assay Reagent Kit manufactured by Pierce Chemical Co., based on a bicinconic acid protein assay method. As a consequence, the amount of adsorption in the article treated with polyacrylic acid only was 33 µg/cm2, although the amount of adsorption in the article further treated by immersion in an aqueous polyacrylamide solution was significantly changed to 150 µg/cm2. 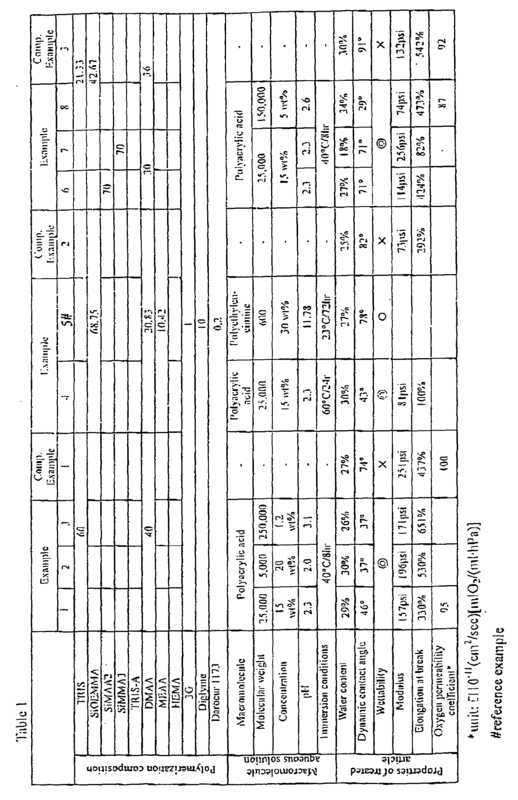 99 parts by weight of methyl methacrylate (abbreviated as MMA), and 1 part by weight of triethylene glycol dimethacrylate (3G) were uniformly mixed. After 0.1 part by weight of 2,2'-azobis-(2,4-dimethylvaleronitrile) (abbreviated as ADVN) as a polymerization initiator had been added thereto, the resulting monomer mixture was degassed in an argon atmosphere. The degassed monomer mixture was injected between glass plates and sealed. The polymerization was performed at 40°C for 10 hours. Subsequently, the temperature was raised from 40°C to 90°C over a period of time 24 hours, and was kept at 100°C for 4 hours so as to produce the plastic article to be treated. The resulting plastic article to be treated was immersed in an aqueous solution, having a pH of 2.6, containing 5% by weight of polyacrylic acid having an average molecular weight of 150,000 at 60°C for 24 hours. Thereafter, the resulting plastic article was sufficiently washed with purified water. The water content, static contact angle of water and wettability of the resulting plastic article were measured. The results thereof are shown in Table 4. A plastic article was produced in a manner similar to that in Example 18, except that the treatment with the aqueous solution containing polyacrylic acid in Example 18 was omitted. The water content, static contact angle of water and wettability of the resulting plastic article were measured. The results thereof are shown in Table 4. 39 parts by weight of tetra-functional macromer produced according to Example 15, 49.4 parts by weight of trifluoroethyl methacrylate (abbreviated as 3FM), 4.1 parts by weight of methyl methacrylate (abbreviated as MMA), 4.5 parts by weight of trimethylolpropane trimethacrylate (abbreviated as TMPT), 3 parts by weight of methacrylic acid (abbreviated as MAA), 0.02 parts by weight of azobisisobutyronitrile (abbreviated as AIBN), and 0.08 parts by weight of azobiscyclohexanecarbonitrile (abbreviated as ACHCN) were mixed and dissolved so as to produce a monomer mixture. The resulting mixture solution was placed in a test tube, the monomer mixture was degassed in an argon atmosphere, and thereafter, the test tube was plugged airtight. First, in a constant temperature water bath, heating was performed at 40°C for 40 hours, at 50°C for 24 hours, at 60°C for 16 hours, at 70°C for 4 hours, and at 90°C for 2 hours, and furthermore, in a hot-air circulation type oven, the heating was performed at 130°C for 30 hours so as to produce a rod-like plastic article. The resulting plastic article was cut into the shape of a circle with a diamond cutter, and the surface thereof was polished so as to produce a plastic article to be treated. The plastic article to be treated was immersed in an aqueous solution, having a pH of 2.6, containing 5% by weight of polyacrylic acid having an average molecular weight of 25,000 at 60°C for 8 hours. Subsequently, the resulting plastic article was sufficiently washed with purified water, was immersed in a boric acid buffer solution having a pH of 7.1 to 7.3 in a vial, and the vial was sealed. The resulting vial was placed in an autoclave, and was subjected to a boiling treatment at 120°C for 30 minutes. After the vial had been left standing for cooling, the plastic article was taken out of the vial, and was immersed in a boric acid buffer solution having a pH of 7.1 to 7.3. The water content, static contact angle of water and wettability of the resulting plastic article were measured. The results thereof are shown in Table 4. A plastic article was produced in a manner similar to that in Example 19, except that the treatment with the aqueous solution containing polyacrylic acid in Example 19 was omitted. The water content, static contact angle of water and wettability of the resulting plastic article were measured. The results thereof are shown in Table 4. According to the present invention, a surface-treated plastic article can be provided, in which the surface thereof has superior hydrophilicity not varying with time while maintaining various properties as the plastic article. In particular, in the case in which the surface-treated plastic articles are optical articles, for example, contact lenses, intraocular lenses, and plastic lenses, the aforementioned superior properties are exhibited, so that superior products can be produced. A method for surface treatment of a plastic optical article, the method comprising a first step of immersing the plastic optical article in an aqueous solution of a first carboxyl functional polymer having a weight average molecular weight of 200 or more, and an optional second step of immersing the article in an aqueous solution of a second polymer having a weight average molecular weight of 200 or more, wherein any second polymer is a non-ionic water soluble polymer. immersing the plastic article in an aqueous solution of a second polymer having a weight average molecular weight of 200 or more, and wherein the second polymer is a non-ionic water soluble polymer. A method according to Claim 1 or 2, wherein the plastic article is a hydrogel having a water content greater than 15%. A method according to Claim 3, wherein the hydrogel contains at least one of a silicon atom and a fluorine atom. A method according to Claim 4, wherein the hydrogel has an oxygen permeability coefficient greater than 50X10-11 (cm2/sec)[mlO2/(ml·hPa)]. A method according to Claim 1 or 2, wherein the plastic article is a macromolecule substantially free from water. A method according to Claim 1 or 2, wherein, in the first step, the aqueous solution has a pH of 6 or less. A method according to any preceding Claim, wherein, in the first step, the first polymer is a carboxyl functional polymer having a weight average molecular weight of 5,000 or more. A method according to claim 8, wherein the carboxyl functional polymer has a weight average molecular weight of 20,000 or more. A method according to any preceding Claim, wherein the carboxyl functional polymer is a polymer selected from poly(meth)acrylic acid, polyitaconic acid, and a copolymer of (meth)acrylic acid, maleic acid, itaconic acid, or maleic anhydride and a reactive vinyl monomer, and mixtures thereof. A method according to Claim 2, wherein the nonionic water-soluble polymer is a polymer selected from polyacrylamide, polydimethylacrylamide, polyvinyl pyrrolidone, polyethylene glycol, polyethylene oxide, and polyvinyl alcohol, and mixtures thereof. A method according to any preceding claim, wherein the plastic optical article is a contact lens or an intraoccular lens. A surface-treated plastic optical article comprising a plastic article of a base material and having, on a surface thereof, a layer of a first polymer complex obtainable by immersing the plastic optical article in an aqueous solution of a first carboxyl functional polymer having a weight average molecular weight of 200 or more, and optionally also a second polymer complex formed with the first polymer and a second polymer which is a non-ionic water soluble polymer having a weight average molecular weight of 200 or more. A surface-treated plastic optical article according to claim 13, wherein the layer comprises the second polymer complex formed with the second polymer which a non-ionic water soluble polymer having a weight average molecular weight of 200 or more and the first polymer having a weight average molecular weight of 200 or more. A surface-treated plastic optical article according to Claim 13 or 14, wherein the plastic article is a hydrogel having a water content greater than 15%. A surface-treated plastic optical article according to Claim 15, wherein the hydrogel contains at least one of a silicon atom and a fluorine atom. A surface-treated plastic optical article according to Claim 16, wherein the hydrogel has an oxygen permeability coefficient greater than 50X 10-11 (cm2/sec)[mlO2/(ml·hPa)]. A surface-treated plastic optical article according to any one of claims 13 to 17, wherein the carboxyl functional polymer is a polymer selected from poly(meth)acrylic acid, polyitaconic acid, and a copolymer of (meth)acrylic acid, maleic acid, itaconic acid or maleic anhydride and a reactive vinyl monomer, and mixtures thereof. A surface-treated plastic optical article according to any one of Claims 13 to 18, wherein the surface-treated plastic article exhibits absorptions at 1720 cm-1 band, 1404 cm-1 to 1442 cm-1 band, and 1556 cm-1 band in the infrared absorption spectrum based on an attenuated total reflection spectroscopy. A surface-treated plastic optical article according to any one of claims 14 to 19, wherein the nonionic water-soluble polymer is a polymer selected from polyacrylamide, polydimethylacrylamide, polyvinyl pyrrolidone, polyethylene glycol, polyethylene oxide, and polyvinyl alcohol, and mixtures thereof. A surface-treated plastic optical article according to any one of claims 13 to 20, which is a contact lens and wherein the first polymer is polymethacrylic acid, and the surface-treated plastic article contains at least one of a silicon atom and a fluorine atom. A surface-treated plastic optical article according to Claim 21, wherein the contact lens has an oxygen permeability coefficient greater than 50X10-11 (cm2/sec)[mlO2/(ml·hPa)]. A surface-treated plastic optical article according to claim 13 or 14 which is an intraoccular lens. Owner name: JOHNSON & JOHNSON VISION CARE, INC.